When writer/director Sebastián Lelio decided to embark on the creation of Una Mujer Fantástica (A Fantastic Woman) he described it as a way to educate himself on the subject. Explaining to the audience of the Golden Globes Foreign Language Film Symposium, “When we came across with the idea of making a film, making this story happen to a transgender woman, that sounded challenging and full of dangers. 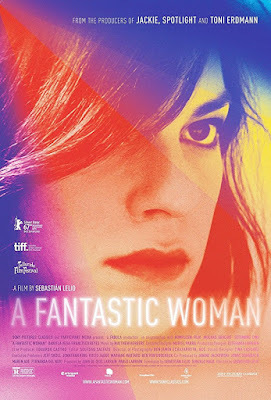 Which was a good sign I guess, but at the same time it was like I knew so little about this, so I need[ed] to get rid of my ignorance.” I feel Una Mujer Fantástica is a successful example of foreign cinema as a form of education, because through the powerful performance of actress Daniela Vega, it is a glimpse into the life of a transgender woman, and the prejudices she faces, as she processes her grief associated with losing a loved one. 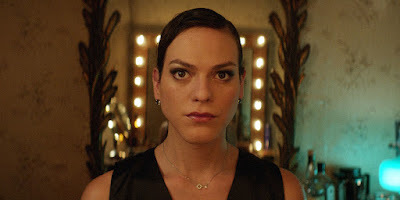 Set in Santiago, Chile, the film follows Marina (Daniela Vega) as she copes with the death of her older boyfriend Orlando (Francisco Reyes), after they spend a romantic evening celebrating her birthday. Having just moved into his apartment, Marina finds herself dealing with Orlando’s family, while they try to understand both his death and her romantic relationship with him. Cinematographer Benjamín Echazarreta’s camera almost never leaves the actress, creating an environment where the audience can share in Marina’s evolving emotional state, as she is treated as less than human by Orlando’s family. It is an environment I can only describe as a feeling of shared violation between the audience and Marina while we encounter each member of his family. These scenes are ‘squirm in your chair’ uncomfortable and provide viewers with a first hand experience in what it is to be ‘othered’. I feel that each of us, as individuals, are always seeking to be seen for who we really are. The feeling of devastation associated with being denied the identity of our true selves, and characterized as something we are not, is something with which every human being can identify. Marina’s loss of Orlando is more than just a loss of loved one. It is also a loss of someone who saw her for who she really is. The film strategically uses images of Orlando throughout Marina’s grieving process to communicate this loss of ‘being seen’ and transforms his death into the birth of her newfound loneliness, as she attempts to reaffirm her identity. Edgar Allan Poe wrote, “From childhood's hour I have not been. As others were, I have not seen. As others saw, I could not awaken. My heart to joy at the same tone. And all I loved, I loved alone.” Una Mujer Fantástica is not just a film about grief but also a study in what it is to be alone, specifically, the painful isolation of a member of the transgender community and their daily battle to chose their own destiny. It is the graceful education for the viewer of the struggle to awaken from the nightmare of a world that refuses to see them for who they really are. Winner of 18 awards including the Academy Award for Best Foreign Language Film, Una Mujer Fantástica is a film you do not want to miss.